Stark contrast is the hallmark of the design in Black & White bathrooms. This particular color combination can be classic or modern, depending on how the shades are applied. 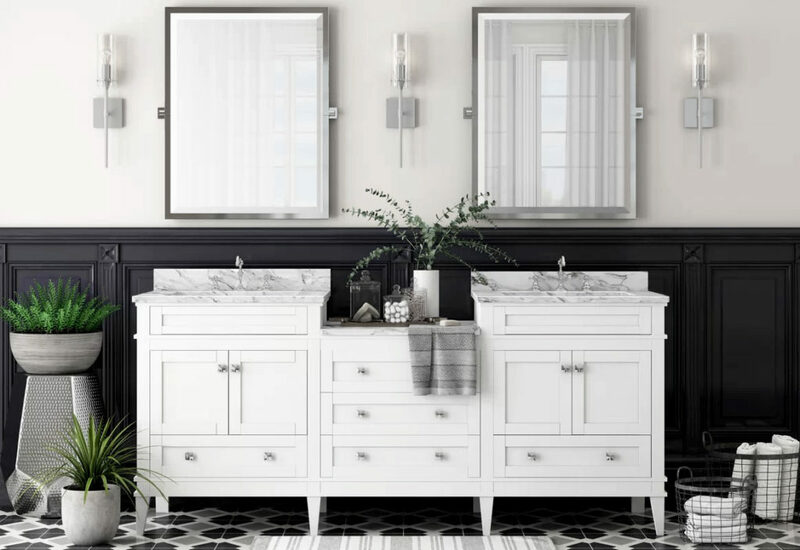 In this collection, we showcase some stunning Black & White bathrooms that are sure to inspire the interior designer inside all of us. 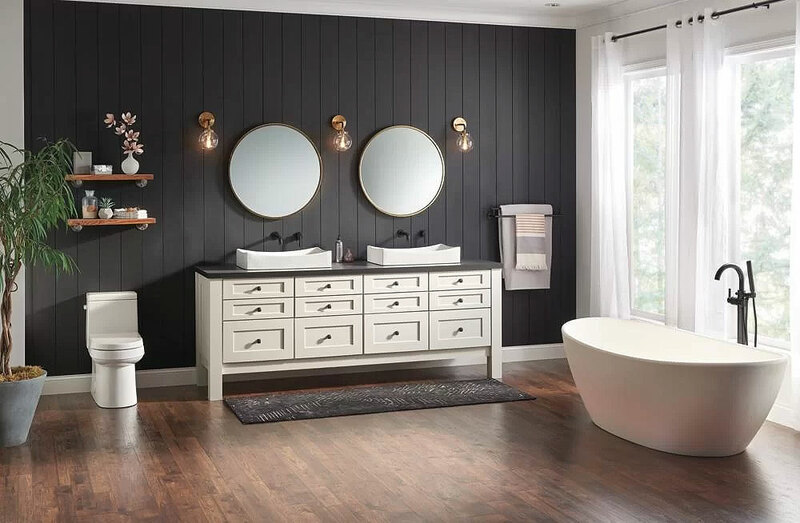 For more details on these stunning bathrooms, check out the Shop the Look links to view more information and find similar products at our affiliated retailer websites. The Clawfoot Soaking Bathtub is the hero in this design, allowing it to take center stage. However, the gorgeous floors, crisp linen towers and urn pendant light help complete the overall look. A simply stunning bathroom that takes the classic aspects of a clawfoot tub and gives it a modern twist. Simple, yet elegant lines create the striking contrasts in this country farmhouse bathroom. All of the black accents are thinner in scale, but still provide a dramatic pop against the white cabinets, tile, and walls. Classic! 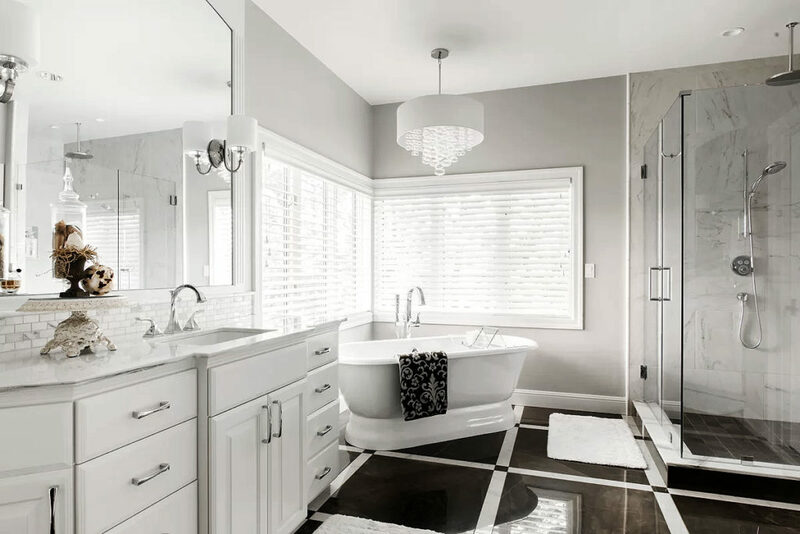 The classic lines of this black & white bathroom create a lovely and streamlined elegance. 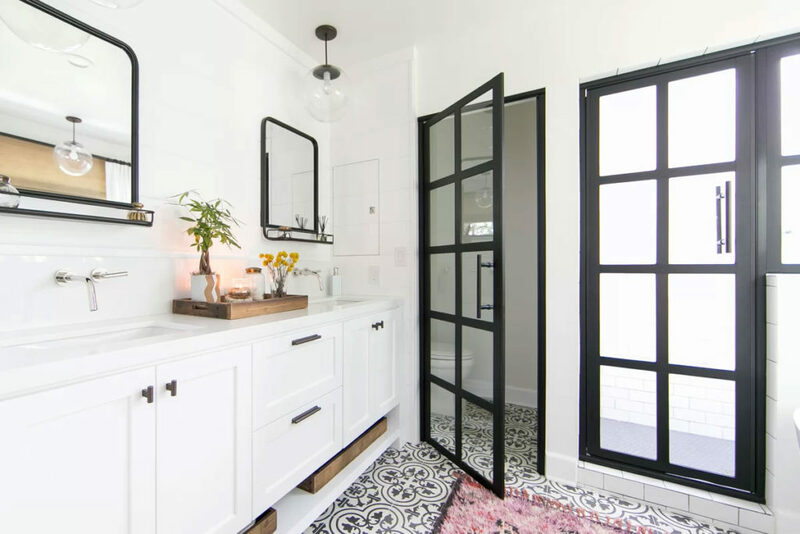 The matching glass & black panel doors provide a set of striking entrances to key areas of the bathroom, while the sleek white double sinks provide plenty of stylish yet usable space. The lighting and industrial-style mirrors complete the look of this amazing bathroom. And how can you NOT love that gorgeous Porcelain Field Tile!! 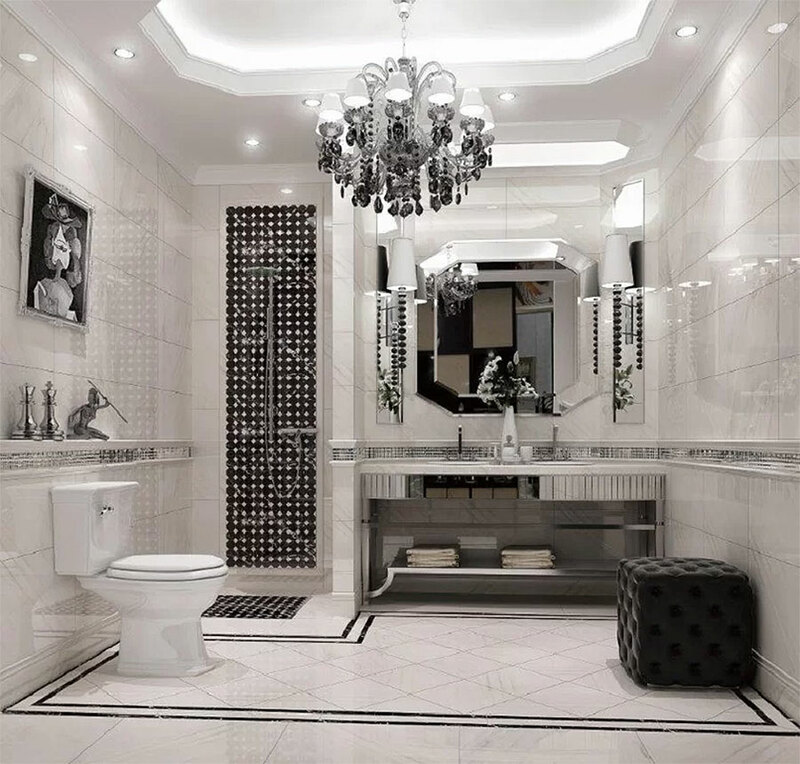 This glamorous black & white bathroom screams opulence and style. With so many gorgeous and glamorous accents, it’s hard to point out just one or two pieces that really stand out, but one cannot help but notice the exquisite light fixtures inside this absolutely stunning bathroom. So much WOW, so little color! 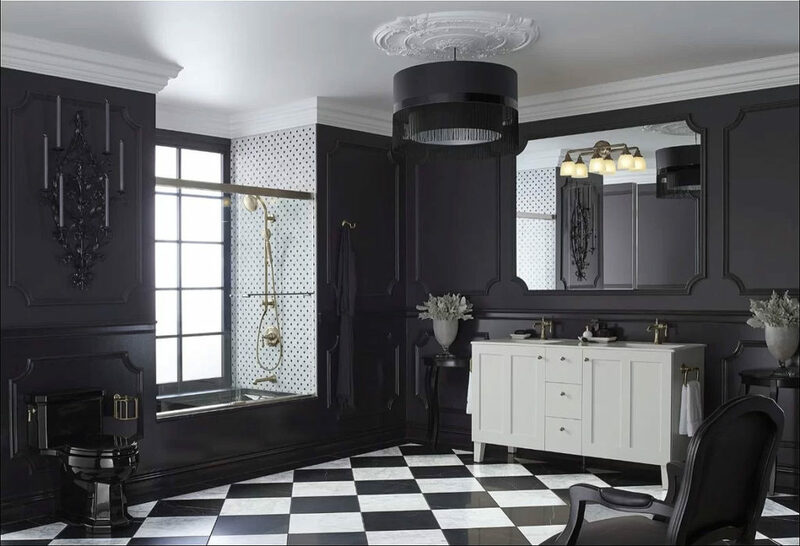 A very dramatic bathroom, and not for the designer who is feint of heart, this room flips the script on the Black & White bathroom by making black the dominant color. The result is an absolutely gorgeous room that has WOW factor written all over it. 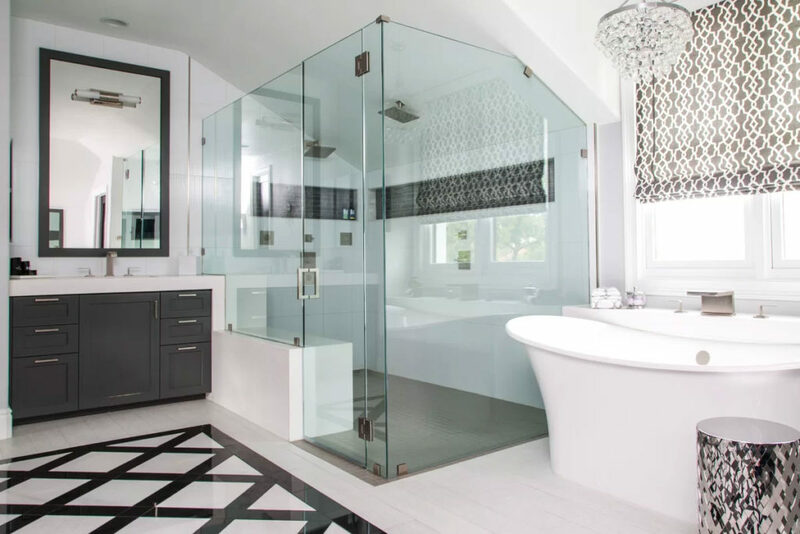 Technically, this bathroom features a mix of black, white, and gray shades to create this modern look… but it is still striking enough to include in this list. The black & white freestanding soaking tub is the focal point in this bathroom, creating a modern touch, backed by soft gray subway tile walls. There’s a reason why clawfoot bathtubs are popular in today’s beautiful bathrooms, and it’s that they are simply spectacular. 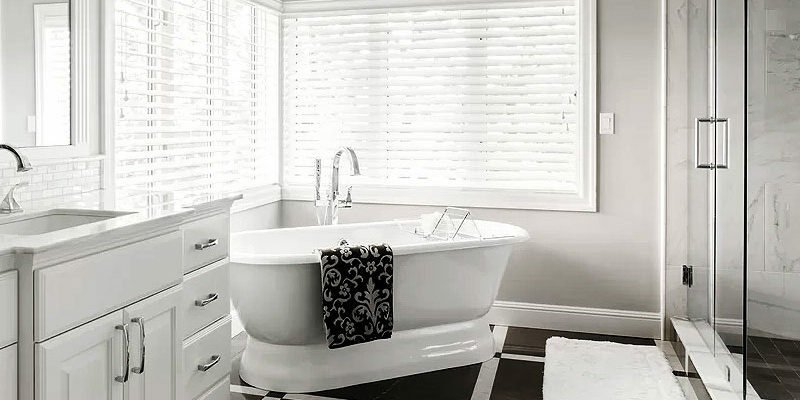 I love this black and white tub, and how exquisitely it contrasts against the other fixtures in the room. The end result is both striking and elegant. Not all black & white bathrooms need to include a tub or shower to create full impact. 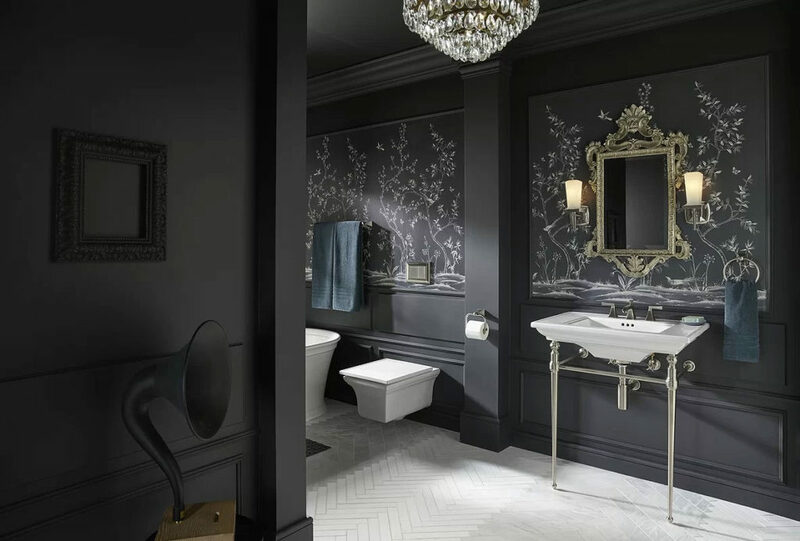 This powder room is classic yet dramatic, with a beautiful mix of class and style. 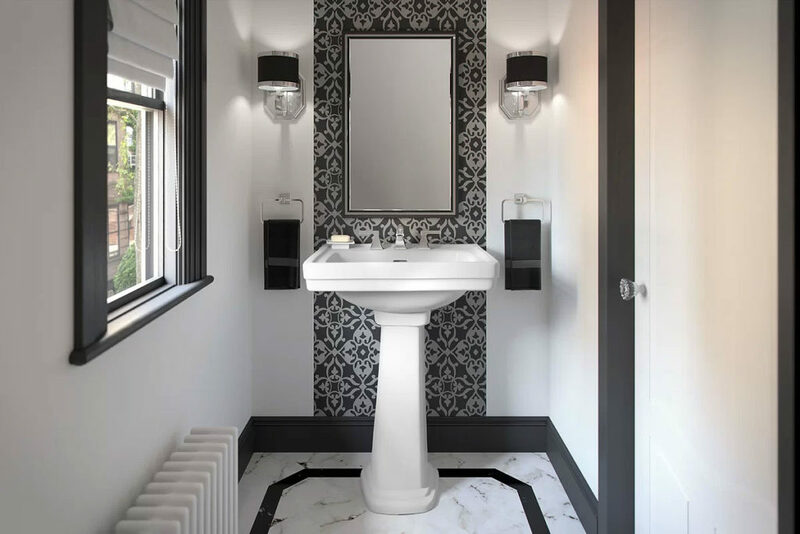 The square pedestal sink is divine, and perfectly offset by the accent strip of wallpaper, the black accent towels, and the chrome and black wall sconces. 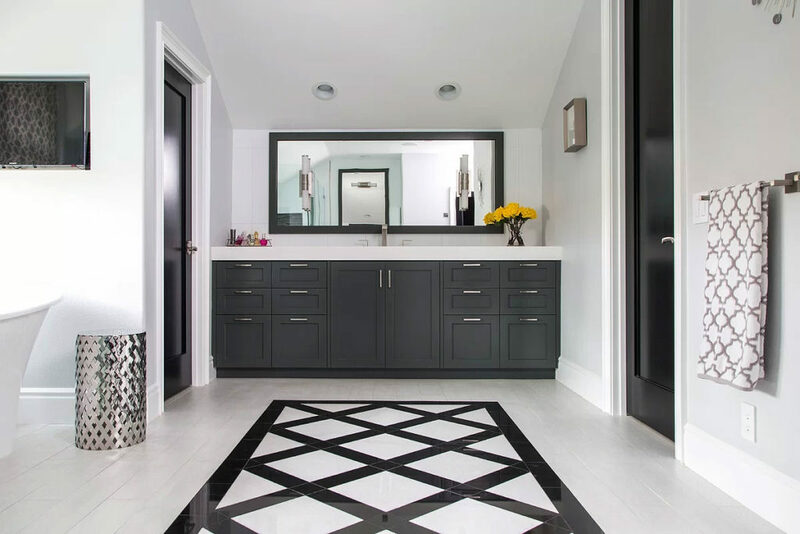 I love the stark contrast of the floating black vanities with the rectangular white sinks, but what is truly striking about this bathroom is how the mirrored medicine cabinets reflect the black tile on the opposite wall, creating the optical illusion that the medicine cabinets themselves are black (which they aren’t). The only think I don’t love about this bathroom is the infusion of brass through the lighting and bathroom hardware. I would have kept the crispness though brushed nickel or stainless tell. The black wainscoting is classic, dramatic, and elegant in this stunning bathroom. 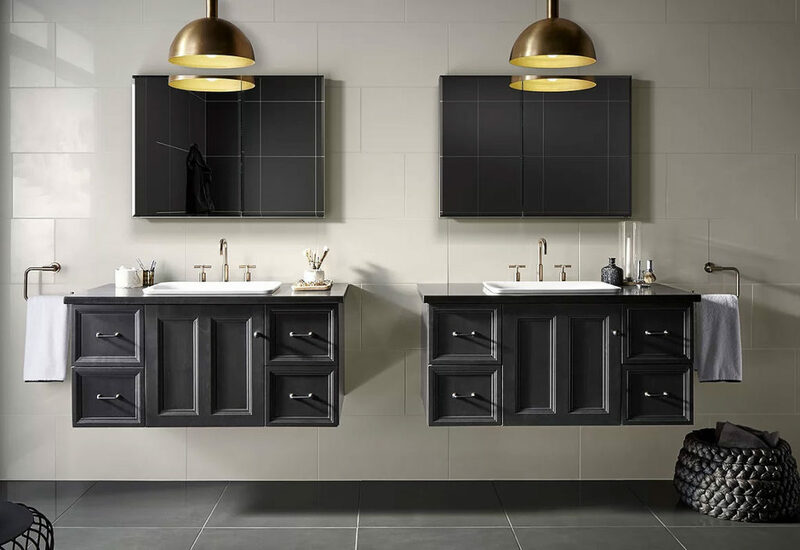 The multi-level double-sink vanity creates visual interest while keeping the lines clean. 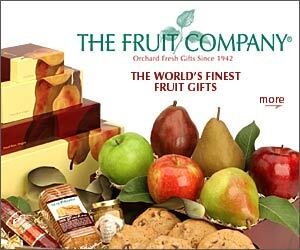 This has a timeless look that could easily fit into a modern or remodeled century home. The black back well really creates a focal interest in this room. 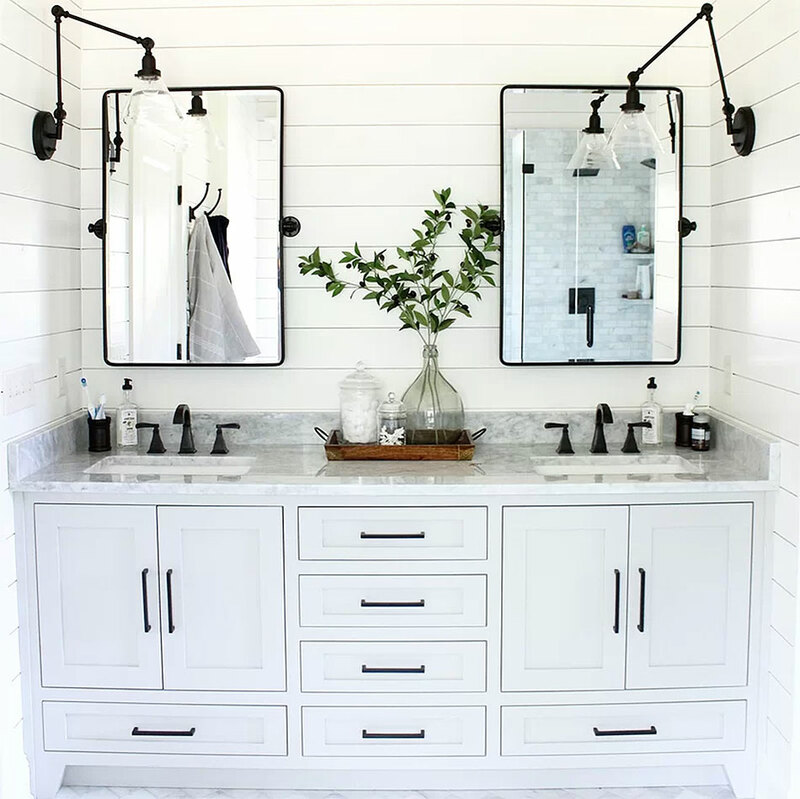 Instead of a more dramatic pure white, a softer off-white was used in the vanity cabinets and the tubs to soften the room and create some natural shading. The result is striking. I love the sleek lines in this Black & White bathroom. 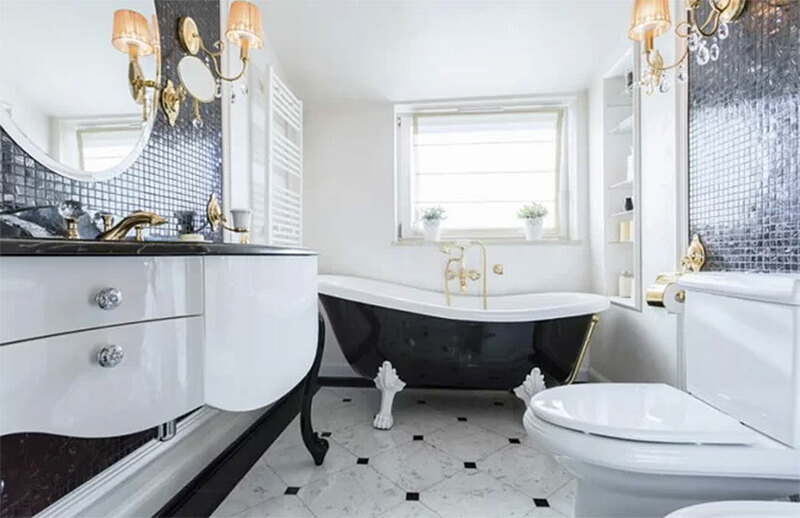 Another bathroom that lets black take the lead in the Black & White scenario, this room features black walls and a black toilet, offset by black and white tiles and a white vanity sink. Bold, daring, an remarkably well executed. 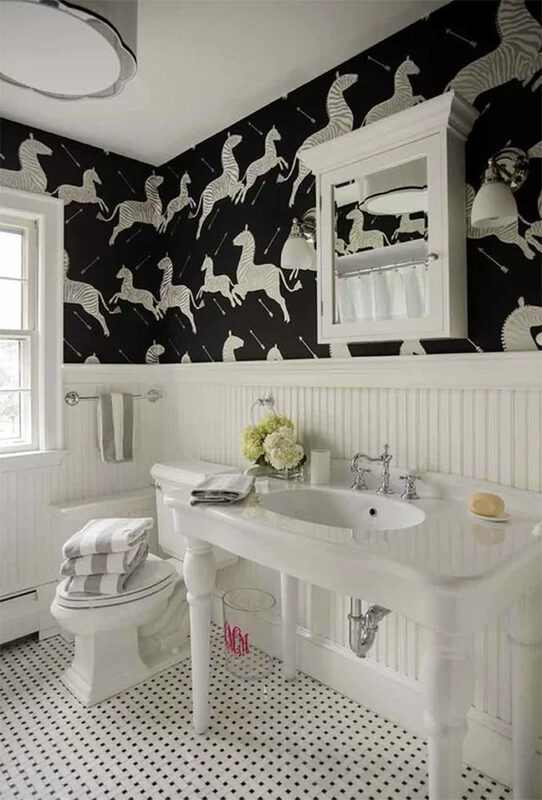 Designed by Catherine & McClure Interiors, this charming bathroom has a delightful country feel, with an exotic touch provided by the Zebra wallpaper. 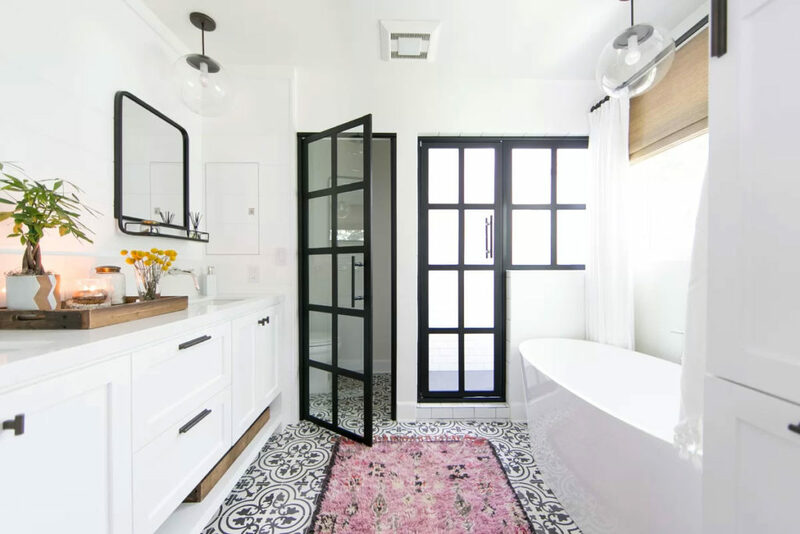 We hope you have enjoyed this collection of Black & White bathrooms and that it has provides some inspiration for your own bathroom decor. 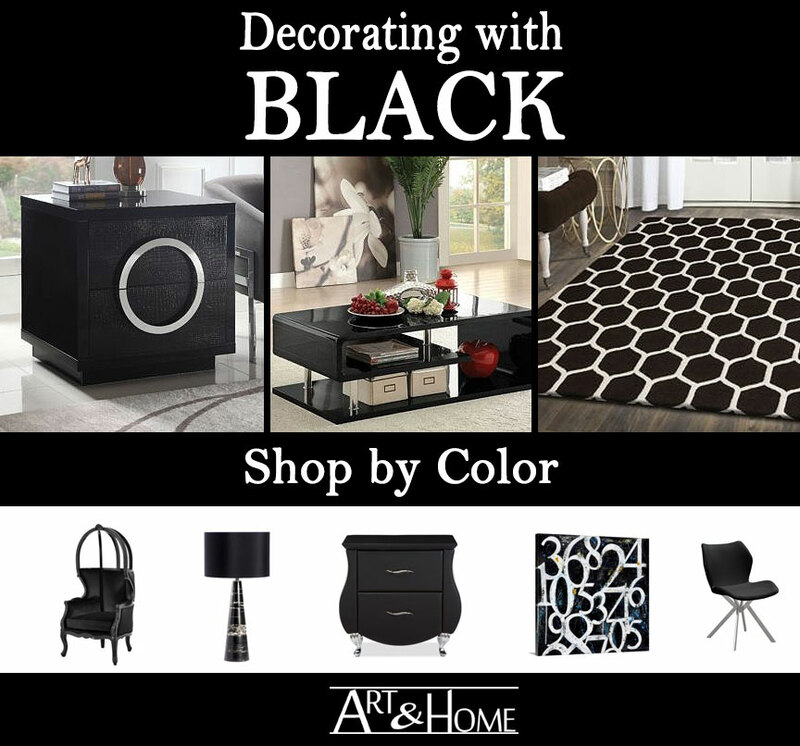 Looking for More Black Furniture & Decor Accents?